The beach town of Dominical is known for its long stretches of black sand and pounding surf. World-class waves bring surfers of all abilities from across the world, yet the town remains small, quiet, and relatively undeveloped. Many expats call Dominical home, which brings Western comforts and community to the area, but the town still has unpaved roads and plenty of local culture. 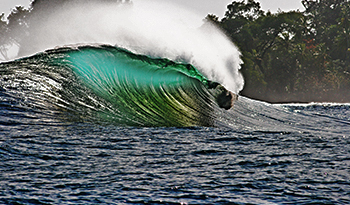 Surfing: Dominical is known worldwide as one of the best surf spots in Costa Rica. The consistent beach breaks can peak as high as ten meters and offer fun waves for all levels. Those looking for big waves should head north to Playa Dominical, while beginners will do well at Roca Verde which has small waves for practicing. There are many surf outfits and schools in Dominical for those looking for board rentals, lessons, and camps. Marino Ballena National Park: Just five miles from Dominical is the Marino Ballena National Park where whales can be seen from the shore nine months out of the year. Whale watching tours can be booked here, and it’s quite common to see plenty of dolphins and whales. This is one of the only places in the world where whales from the Northern Hemisphere and the Southern Hemisphere converge (the other being North Africa), and it’s possible to see as many as six species of whales here, including the magnificent humpback whale. At the northern end of the Marino Ballena National Park is the famous Punta Uvita, also known as the “Whale Tale.” At low tide, a 600 meter sandbar appears separating the sea and creating a dramatic pathway simulating a whale’s tale. Diamante Falls: Located in Playa Dominical, the Diamante Falls are some of the most spectacular waterfalls in the country. After a half hour trek into the jungle, one will find a series of seven waterfalls cascading down the rocks. The largest waterfall stands 600 feet. The surrounding jungle and Rio Baru is full of macaws, toucans, sloths, armadillos, monkeys, and lots of reptiles. Kayaking and SUP: Various outfits in Dominical lead tours of the nearby mangroves, spotting various species of animals. These tours can explore caves on kayaks and on stand up paddle boards. Tours go along the coast, to the Punta Uvita along the Rio Baru, and even to Manuel Antonio. 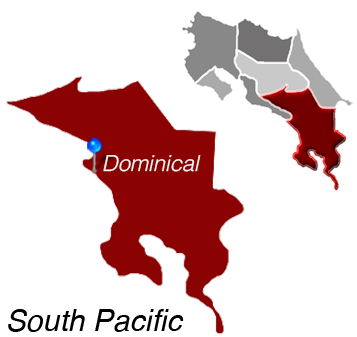 Dominical is Located in the South Pacific.